BitFontCreator Pro is a professional and feature-rich font creator tool that enables you to create and edit monochrome bitmap fonts. 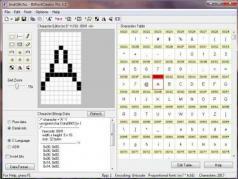 You can also use the program to easily export bitmap data in numerous types of file formats. BitFontCreator Pro can be used to create monochrome 1-bpp bitmap fonts and antialiased 2-bpp and 4-bpp bitmap fonts for graphical LCD/LED. Regarding export options, the application also lets you save the font as a .BIN or .ASM file. This software will offer you the possibility to customize your fonts according to your preferences and needs.